Today's guest post is from Melinda at Palindrome at Home. She's genuine, funny, and creative - and I hope we get a chance to meet this summer at BlogHer 2011! Her Friday Finds posts are some of my favorites, so I asked her to be my guest today to share her finds with you. I'm doubly excited to be with you today on Latte Love! First, I met Katie on Weddingbee over a year ago now and I really admire her. This lady is a lady of substance and beauty, inside and out! I was flattered when she asked me to pop over. Second, I'm super excited that she's heading to Milan! We both honeymooned in Italy and bonded over our experience. If we had the chance to live abroad, we'd jump at the chance! Friday finds is a little collection that I do over on my blog which involves me combing through my pages of favorites on Etsy. 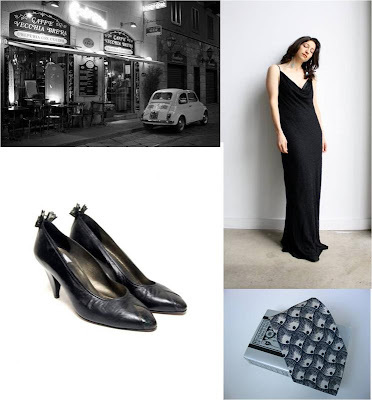 In honor of Milan, I decided to curate a vintage Italian fashion collection for Latte Love!